I first heard the Raymond and Peter tapes the same place I heard most anything worthy of merit in Cleveland, on college radio, WCSB-FM, in this case. Wow, I went to a borderline Ivy-League university (didn't do me an ounce of good in the job market; it was Syracuse, if you want to cancel your enrollment - fine with me) and the well-funded campus radio station was W-LAME-FM. Ill-regarded Cleveland college stations here in Failuropolis were tons more creative and cool, and schooled the mostly unemployed post-graduate me in much audio arcana, including phone pranks and wild surreptitious recording. The Raymond and Peter tapes are classics among the latter. Even so, I wondered how a docu-feature could properly handle this milestone in transgression. But the Australian (! You'd never guess) film SHUT UP LITTLE MAN! does the job heroically. It describes how cult-audio history was made in 1987 when two young midwest transplants to San Francisco, graduates Mitchell D and Eddie Lee Sausage, bent on escaping their dreary native Wisconsin, moved into a pink-colored apartment building they compared to a bottle of Pepto Bismal. The boys soon found their next-door neighbors, Raymond (Huffman) and Peter (Haskett), aging chronic alcoholics, fought verbally and sometimes physically through the night. Initially the sleepless youths made tape recordings as potential evidence for the police in case any violent crime resulted. But soon taping the drunken, profane harangues, homophobic slurs and almost ritual insults ("Shut up li'l man!" "I AM the human race!") became an entertainment pastime. Mitchell and Eddie deployed an improvised boom microphone made from a ski pole right outside R & P's window for maximum audio quality, given the circumstances, and used sound samples in music-mixtapes circulated amidst friends. Ultimately they issued some 14 hours of Raymond/Peter arguments. As the tirades were copied and passed throughout the cassette-tape underground (and aired on brave stations like WCSB 89.3-FM) the midnight ravings of Raymond and Peter went `viral' before the cyber-term was coined. As this film shows, there have been Raymond and Peter CDs, music remixes, comic books, stage dramatizations - and at least three Hollywood film projects that failed to launch (one of which had the hubris to kick around the idea of Jack Nicholson and Marlon Brando as the stars), partially because Mitchell and Eddie first made the material available "open source," as the phrase goes, then reconsidered and copyrighted it - thus guaranteeing insoluble legal claims and counter-claims on the stuff that started to look as unseemly as a Raymond-Peter spat. 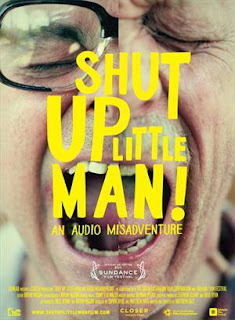 But it was a good thing because it left the field open for filmmaker Matthew Bate's SHUT UP LITTLE MAN! detailing the reality-audio voyeurism the way it should be told. Interviewees include graphic-novelist Daniel Clowes and cartoonist Ivan Brunetti. Just a few of them wonder if the whole phenomenon exploited two sad, bottoming-out drunks, and here we see 1990s video footage, made after Huffman died and Haskett was soon to follow, in which an oblivious Peter is informed (and not for the first time; seems he has a memory-retention problem) he's a worldwide alt-celebrity, quoted and, er, loved by millions. He just can't comprehend it. A wistful finale, one of various re-creations of the Raymond-Peter tango using professional actors, aspires to restore some dignity and humanity to both men, though how well it succeeds is probably up to the viewer - and how guilty the viewer feels being complicit. When the now-adult Eddie and Mitchell show off an official Raymond Huffman death certificate they peddle, one does feel a little soiled. Watched this myself over the weekend and loved it, too.